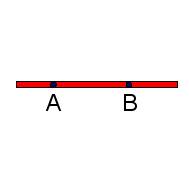 Line AB (in red) through points A and B (in blue). Of course, a thick and bounded image can only hint at an ideal line. In Euclidean geometry, a line (sometimes called, more explicitly, a straight line) is an abstract concept that models the common notion of a curve that does not bend, has no thickness and extends infinitely in both directions. It is closely related to other basic concepts of geometry, especially, distance: it provides the shortest path between any two of its points. In space it can also be described as the intersection of two planes. Assuming a common (intuitive, physical) idea of the geometry of a plane, "line" can be defined in terms of distances, orthogonality, coordinates etc. In a more abstract approach (vector spaces) lines are defined as one-dimensional affine subspaces. In an axiomatic approach, basic concepts of elementary geometry, such as "point" and "line", are undefined primitives. 2.1 What is wrong with the definitions given above? By lines we mean straight lines. Lines are treated both in plane geometry and in solid geometry. Plane geometry (called also "planar geometry") is a part of solid geometry that restricts itself to a single plane ("the plane") treated as a geometric universe. In other words, plane geometry is the theory of the two-dimensional Euclidean space, while solid geometry is the theory of the three-dimensional Euclidean space. To define a line is more complicated than it may seem. It is tempting to define a line as a curve of zero curvature, where a curve is defined as a geometric object having length but no breadth or depth. However, this is not a good idea; such definitions are useless in mathematics, since they cannot be used when proving theorems. Straight lines are treated by elementary geometry, but the notions of curves and curvature are not elementary, they need more advanced mathematics and more sophisticated definitions. Fortunately, it is possible to define a line via more elementary notions, and this way is preferred in mathematics. Still, the definitions given below are tentative. They are criticized afterwards, see axiomatic approach. Three equivalent definitions of line are given below. Any other definition is equally acceptable provided that it is equivalent to these. Note that a part of a line is not a line. In particular, a line segment is not a line. We could also define a line as the intersection of two planes (neither parallel nor coinciding). However, this definition does not work in plane geometry. The first definition (via betweenness) works both in plane geometry and in solid geometry. The other two definitions apply in plane geometry only. that is, the distance from A to B plus the distance from B to C is the distance from A to C. Less formally, B lies on the shortest path from A to C.
Among three points of the given set there is always one that lies between the two others. If one of three distinct points lies between the two others, and if any two of these three points belong to the given set, then the third point also belongs to the given set. Remark 1. A line segment satisfies the first condition but violates the second. A plane satisfies the second condition but violates the first. Remark 2. A set satisfying the second condition is either the empty set, or a single point, or a line, or a plane ("the whole plane" in planar geometry), or the whole space (in solid geometry). In the first two cases the set fails to contain more than one point. The last two cases violate the first condition. If B lies between A and C, and the points A, C belong to the given set, then B also belongs to the given set. A set satisfying this weaker condition is called convex. A line is convex; also a line segment is convex; a triangle (including interior) is convex; also a disk is convex (but its boundary, a circle, is not). The definition of "line" given below may be compared with the definition of "circle" as consisting of those points in a plane that are a given distance (the radius) away from a given point (the center). A circle is a set of points chosen according to their relation to some given parameters (center and radius). Similarly, a line is a set of points chosen according to their relation to some given objects (points, numbers etc). However, a circle determines its center and radius uniquely; for a line, the situation is different. Below, all points and lines are situated in the plane (assumed to be a two-dimensional Euclidean space). This is the line orthogonal to the line AB through the middle point of the line segment AB. This is the line orthogonal to the line AB through the point A. The condition means that the lines AB and AC are orthogonal, that is, the angle BAC is right (unless C=A), see Pythagorean theorem (orthogonality is not only sufficient but also necessary for the equality). Here real numbers a, b and c are parameters such that at least one of a, b does not vanish. For every two different points there exists one and only one line that contains these two points. There exist three points not lying on a line. For every line and every point outside the line there exists one and only one line through the given point which does not intersect the given line. Two lines either do not intersect (are parallel), or intersect in a single point, or coincide. Two lines perpendicular to the same line are parallel to each other (or coincide). What is wrong with the definitions given above? The definitions given above assume implicitly that the Euclidean plane (or alternatively the 3-dimensional Euclidean space) is already defined, together with such notions as distances and/or Cartesian coordinates, while lines are not defined yet. However, this situation never appears in mathematical theory. In the axiomatic approach points and lines are undefined primitives. The modern approach (below) defines lines in a completely different way. Axiomatic approach is similar to chess in the following aspect. A chess piece, say a rook, cannot be defined before the whole chess game is defined, since such a phrase as "the rook moves horizontally or vertically, forward or back, through any number of unoccupied squares" makes no sense unless it is already known that "chess is played on a square board of eight rows and eight columns" etc. And conversely, the whole chess game cannot be defined before each piece is defined; the properties of the rook are an indispensable part of the rules of the game. No chess without rooks, no rooks outside chess! One must introduce the game, its pieces and their properties in a single combined definition. Likewise, Euclidean space, its points, lines, planes and their properties are introduced simultaneously in a set of 20 assumptions known as Hilbert's axioms of Euclidean geometry (solid). It is possible to exclude plane-related axioms thus obtaining axioms of Euclidean plane geometry. The "most basic properties of lines" listed above are roughly the line-related assumptions (Hilbert's axioms), while "further properties" are first line-related consequences (theorems). The modern approach defines the three-dimensional Euclidean space more algebraically, via linear spaces and quadratic forms, namely, as an affine space whose difference space is a three-dimensional inner product space. For further details see Affine space#Euclidean space and space (mathematics). The Euclidean plane, that is, the two-dimensional Euclidean space is defined similarly. In this approach a line in an n-dimensional affine space (n ≥ 1) is defined as a (proper or improper) one-dimensional affine subspace. In geodesy, theodolites use light rays as straight lines. They can measure angles with accuracy about 10–6 of the right angle. General relativity theory predicts that the sum of the three angles of a triangle may differ from two right angles because gravitation influences the geometry of the space, making it non-Euclidean. Near the Earth, the angle deficit is about S/(1024m2), where S is the area of the triangle. Thus, for a triangle with all sides of 1000 km, the angle deficit is about 10–12 of the right angle, — for now, far beyond accuracy of measurements. This page was last modified 16:11, 6 September 2013.